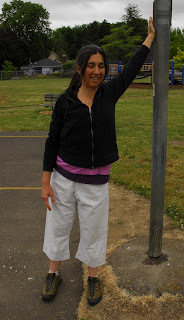 Ask the Yogini: Rest Stop Yoga: Hips and Shoulders! 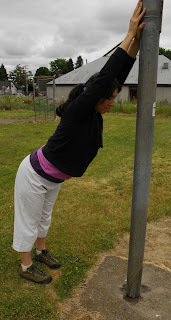 Rest Stop Yoga: Hips and Shoulders! Take your arms up the pole over your head. Step back and let your head rest between your arms. Lift your sitting bones up and allow a gentle arch in the low back. Bend and extend the knees softly. Let your head and neck undulate moving from side to side. Rock your low back. Let the kinks flow out of the body. Switch your arm position so that each hand has a chance to rest on top of the other. Engage your lower abdominal muscles and pelvic floor, then bend your knees and step toward the pole to come out of the pose. 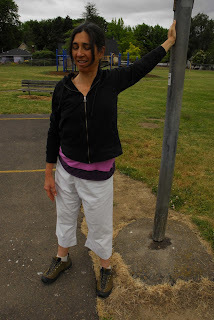 Stand beside the pole and hold the pole to help with balance. Bend a knee and catch your ankle with your hand. 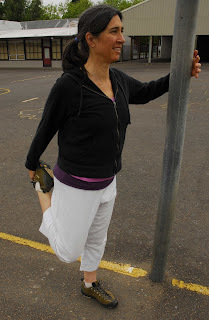 Lift your heal toward your outer hip or buttock to stretch your knee deeply. Keep the lift of your belly, chest and heart. Holding a steady gaze will further support your balance. Now press your foot into your hand and rotate your thigh bone backward in the hip socket to extend at the hip. Keep engaging your abdominal muscles so that you belly button reaches toward your spine and you resist the tendency to rotate your hips forward. 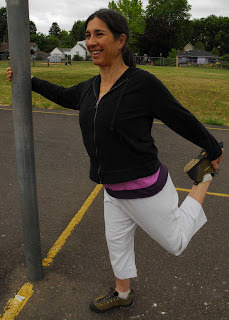 The stretch will move from your knee into your Quadracep (front thigh) and Hip flexor muscles. The deeper you are able to work your abs the more you will be able to extend the stretch into those hip flexors. Hip flexors get both lax and shortened by extended periods of sitting. Stretching them out will go along way toward having a healthy and happy low back. Repeat the knee and hip flexor stretch on both sides a few times. Reach one arm up the pole. Ground through your feet and reach through your arm. Then slowly turn your body away from the pole and your arm. You'll be stretching from the sternum up through the shoulder and armpit and all along the underside of the arm. You can slowly turn your head right and left to enhance the stretch in your neck muscles as well. Walk your hand slowly down the pole as you turn your body away. As you move the arm through its rotation from over head to by your side, the stretch will move through various bands of muscle and connective tissue. Linger where the stretch feels especially good. When you've finished one side stand tall in tadasana. Let your arms hang free and close your eyes. Relish the sense of openness in your shoulder. Then turn and stretch the other side.